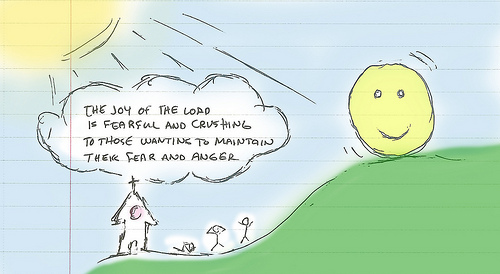 Why Do We Fear the Joy of the Lord? Why Do We Not Believe God Will Be Good? I was reading my daughters’ children Bible to them the other night regarding the Israelites complaining before God. It mentioned how God rescued them from Egypt, had parted the Red Sea for them, and had given them bread in the desert. And yet, they grumbled to God. This got me to thinking about a sketch I doodled the day before (above). Why is it that the Israelites, who saw so much of God’s goodness to them, doubt His continued goodness? In Numbers 14:2-4 they desire to even go back into Egypt because they did not believe God would provide for them to enter the promised land. The thing is – God was providing for them all along the way, but it did not look like how they wanted to be provided for. He had sustained them in the desert. He had led them by cloud and fire. It is the joy of the Lord to bless His children. Blessings flow freely from His throne onto those He loves. He lavishes us with every blessing in Christ. Yet, we think we know what those blessings should look like. How many people are being pursued by God’s love and provision that think God is out to get them? One thing I have thought about a lot is Jonah first response to God’s call to go to the Ninevites. Quite often we are taught that Jonah did not want to go because he was scared. The real truth is in Jonah 4:2. Jonah knew that God’s heart is for repentance and restoration, and Jonah did not want God’s grace to come to them. His view of the way things should be did not line up to what God wanted to do, and He despised it. But when we stepped back to watch what was going on around us, we could see His provision in many different ways. We had flexible owners in our temporary home and the more permanent home who were understanding of our plight. Our kids were also very flexible with adjusted schedules. We were forced to take free time with the family as there were no home items to set up. And, God kept reassuring us He was in the process, which allowed us to go through the whole ordeal with little stress. If we had maintained our focus on the circumstances surrounding us, we would have never been able to receive the provisions God had already given us. Also, God’s ways are not like ours. His goodness abounds. He does not get surprised by the events of our lives, nor is He restricted by them. As Christians, we are His sons and daughters. He loves us. If we come to Him, He will give us good gifts. This does not mean life will be easy. We are to take up our cross daily. But, we have hope and joy because we know the heart and character of the One in control of everything. We know He loves us, and whatever we suffer for Him will be redeemed. Therefore we can take heart even if we are in the middle of the sea with waves all around us. Jesus may be on the shore watching us, He may be on the boat asleep, or He may be walking by on the water. Whatever He may be doing, He is ready and not anxious about our circumstances. He has got something up His sleeve. If you are in one of these situations, go to God in prayer. Ask Him His interpretation of the events. Grab another believer to pray with you. Whatever you do, do not let the circumstances dictate what your reality is. Only Jesus can determine that. And, He has a good view of things.